Awww! Even dandelions can be beautiful when they're picked with love! Very pretty - I love yellow flowers! What a perfect way to brighten your day...hey, I rhymed! LOL! You have some sweet kiddos! Those are big! Ours are much smaller. I love that your kids brought you flowers! So sweet! I love flowers, especially when a little one has picked them! That is so sweet! I used to do that for my mom. They are reminding me of my son! =) He has become facinated with the dandelions in the grass! 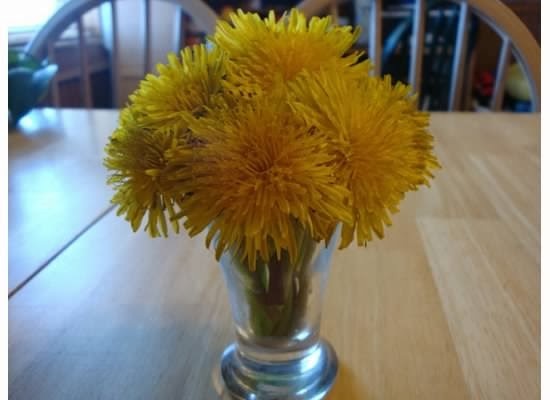 I love when my daughter picks dandelions for me! Who knew such an annoying little weed could brighten your day so much when it comes from some sweet kids? Very Sweet and beautiful, too! those look so sunshiny + beautiful. ella + i just picked some dandelions yesterday. if my husband knew he would be so upset, he cannot stand seeing them in out yard! That is so sweet to display them. My eyes would be burning and running the whole time, heh.